Ah...the holiday of Purim. Beloved of children, for its silliness and costuming. Beloved of adults for the right to be completely silly on this one day. One year, for Purim, I was "thing 1" to the other rabbi's "thing 2" and I did somersaults down the center aisle of our sanctuary. This year, not quite as exciting...we were construction workers in honor of the construction work being done on our building. David strongly wanted to be Harry Potter. 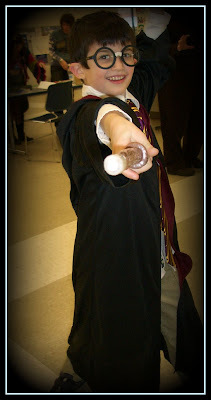 I'll post more about his costume on Wednesday, but suffice to say that I'm willing to go all-out for this awesome holiday...and so Harry Potter it was! My Sammy was a little busy bee. 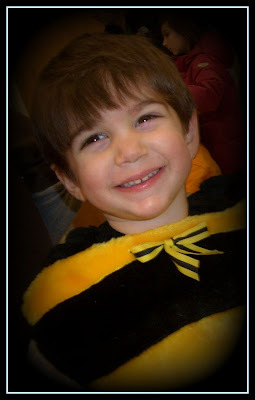 There's a great midrash about King Solomon and the Bee so I figured it was a good Jewish costume. Plus, the only kosher food to come from a non-kosher animal is honey...which comes from a bee, and that strange contradiction is perfect (in my opinion) for the topsy-turvy nature of Purim! They had such a good time celebrating this holiday (which actually doesn't happen until the end of the week...but it's all-Purim, all the time here this week!) 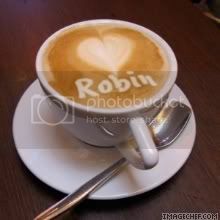 is just the most wonderful thing for me. I want my kids to have warm and powerful Jewish memories and associations...and it's my job to create them! and see what FrumeSarah has to say -- join our Purim Party! These look great! I've never been to a Purim party. This year, I think my kids will be the Princess and the Pea (she'll be a princess with the letter P hanging from a necklace), the tooth fairy and a chicken. The big kids came up with the first two and the last one came from our closet. They're both adorable, and I think you should post a picture of your own costume as well :). Mine are going as a wrestler and Cinderella this year (oh my aching feminist sensibilities LOL) - their choice obviously. Except, Cinderella is wearing a knee-length white dress, because that is what my daughter absolutely insisted that Cinderella wears. Don't even ask how long it took to find one that passed muster. The main school dress-up day (where they can where whatever costume they want) is Wednesday but Itai has to have different costumes all week. Yesterday he was Mordechai for "Bible characters day", today is "sports day" (whew, that one's easy), tomorrow is "Survivor" (must locate a bandana), and Thursday is pajama day (whew, another easy one!). He's having a ball. My picture is from our Purim carnival too! I called our Rabbi The DREAD-Pirate Rabbi all afternoon. The costumes are great. Hope you had fun!! Mine were a Death Eater (another Harry Potter fan) and a rock star. I gave up on the traditional costumes long ago! Your kids are adorable! Yes, we want to see your costume, too! Very cute costumes, and great Harry Potter shot! Both costumes are adorable.. sounds like a great time! Yes - he is DEFINITELY cute! love the costumes -- and that bee is just adorable! What a fun time! That's a very authentic Harry Potter, and one of the cutest bees I've ever seen. But yes, we wanna see YOU too! They are both SO CUTE! And what a fun thing to get to be a part of! Hey, any reason to dress up is golden in our house. We wear tutu's and princess crowns to the grocery store, with our cowgirl boots, of course! How adorable. Those will be fantastic memories. Hey, that looks like a blast! You kids both look adorable as Harry and the Bee. Awesome costumes!! What about Yael?? Yep, the poster boy of cute. You're Invited to our Purim Party! 13 Things I Love About Purim! Holy to God...the Tabernacle is Complete!